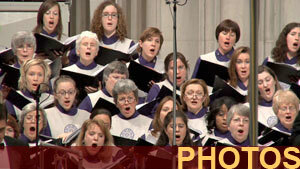 Minnesota enjoys a well-earned national reputation for excellence in choral music. According to Chorus America, Minnesota is home to more than a hundred independent professional, community and youth choirs in addition to thousands of school and church choirs. Prominent Minnesota composers write extensively for the voice, and in 2002 we welcomed more than 3,000 singers from around the globe to the World Choral Symposium. What's behind this passion for singing? Never Stop Singing celebrates Minnesota's choral legacy through interviews with leading conductors and composers, rehearsal and performance footage, and historical background. Noted musicians Dominick Argento, Anton Armstrong, Philip Brunelle, David Cherwien, René Clausen, Peter Hendrickson, Maria Jette, Stephen Paulus, Robert Robinson, Kathy Saltzman Romey, and Dale Warland are among the many voices who share their insights and enthusiasm for the choral art. In addition to the one-hour documentary, the project includes extended interview segments and musical excerpts compiled on a special DVD which is available to Minnesota choral conductors. Never Stop Singing is now online! Go to www.tpt.org/never-stop-singing/ and watch the entire program, courtesy of TPT. In September 2010, Never Stop Singing won an Upper Midwest Regional Emmy Award in the "Arts & Entertainment Program" category! Presented by the National Academy of Television Arts and Sciences, this year's regional Emmys included entries from broadcasters and producers in Minnesota, North Dakota, South Dakota, Iowa and western Wisconsin. Never Stop Singing is a production of Myers Communications Group, LLC in partnership with Twin Cities Public Television.